Alkemy is a miniatures game that takes place in a fantastic medieval context. During your games, you take control of a group of fighters represented by miniatures and stage them against an enemy group. Each game is articulated around a scenario, with goals to be filled that will allow players to score victory points. There are 2 versions of the game, the “blitz” version being played on a small playing surface (24 x 24 inches) in 180 points (6 to 7 miniatures on average) for 45 minutes to 1 hour, and the “origin” version (36 x 36 inches) played in 280 points of miniatures (between 10 to 15 miniatures) during 1h30 to 1h45 hours. The rules for these 2 versions are the same, apart from the number and size of the scenery sets, the number and arrangement of the components. Obviously, you can play in any other format in agreement with your opponent. Each miniature has life points, cut in 3 colors (white, yellow then red). 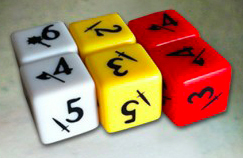 Depending on the state of health of the miniature, we play with the dice of color (white, yellow and red). The more your miniature is injured, the harder it will hurt to hurt the opponent. Why ? Also, on each face of the dice, there is a symbol (axe, mass and sword). By combining 2 symbols, you will read directly the damage inflicted by the miniature (each miniature has a table of damage). – the reflex on the left (in blue) which will be used during the fights to strike as quickly as possible. – AP (Action Points) in the center (in black). It goes from 2 to 4 AP. Doing a walk, a fight, a shot, a charge, etc., everything costs 1 AP… AP determine the number of possible actions to be done during 1 round, during activation or in reaction. – The fight on the right (in red-brown) is the combat value that we add to 2 dice for the fight. – the defense down (in green-gray) is the defense value that will have to pass the opponent to succeed in hurting you. 5/7/12 are the movement values in inches (in Alkemy, we play in inches, English measure, 1 inch = 2.54 cm). 5 = walking / 7 = charging attack / 12 = running. 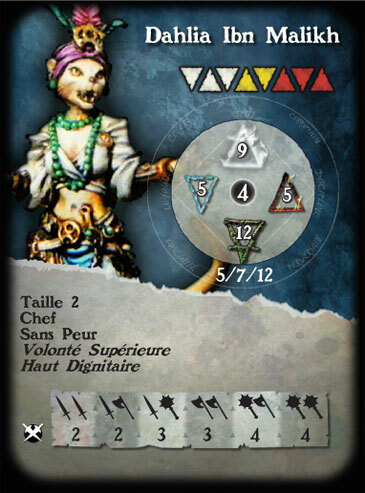 Then, it is the size of the miniature (standard size = 2) then the list of the skills of the miniature whose explanations are given on the back of the profile card. Then comes the damage table of the miniature, with the famous combination of dice mentioned above, which directly give the damage inflicted by the miniature.